I’m not quite at the “Don’t know much about art but I know what I like” level of art appreciation but I’m not that far off. 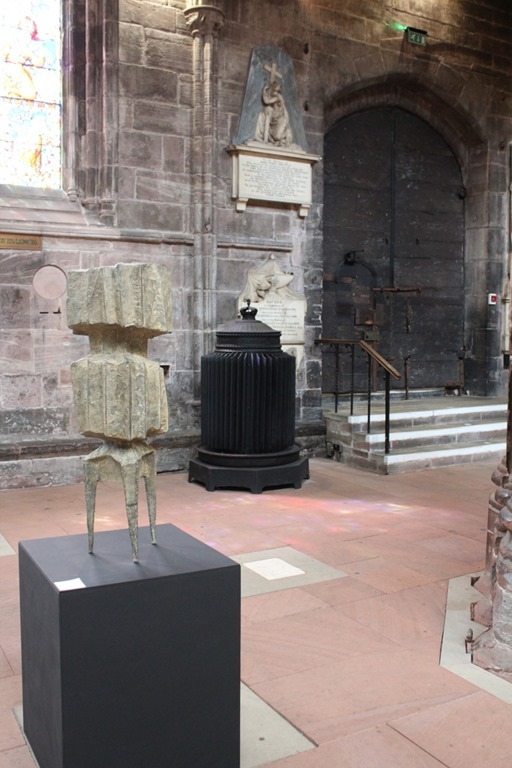 So it feels a bit odd to be taking to the airwaves to rave about a sculpture exhibition at Chester Cathedral. The exhibition is called ARK and runs until the 15th October. (Details of ARK here). It’s free to enter although we bought a map for £2 and a catalogue/guide for £12 which I count as exceedingly good value for money. 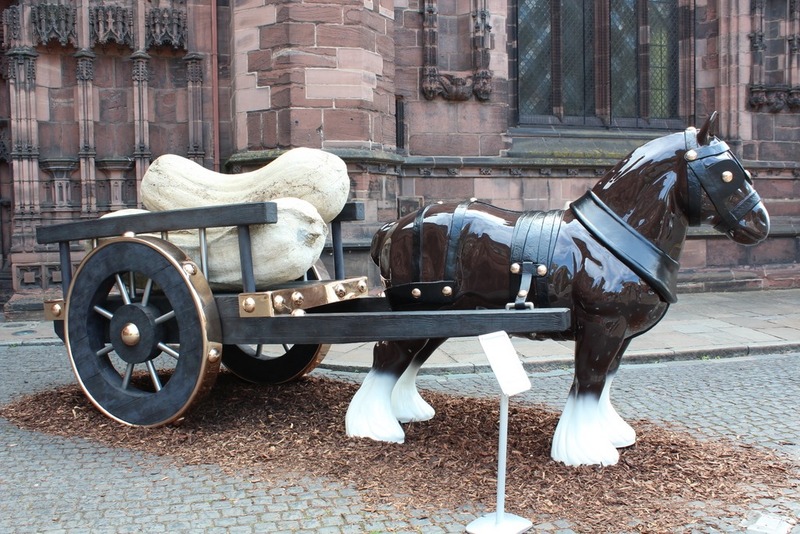 The first hint that Something is Going On is the piece outside the normal cathedral entrance: what appears to be a life-sized seventies style ceramic model of a Shire horse, pulling a cart containing two concrete marrows which look remarkably like the BFG’s snozzcumbers. It’s actually Perceval by Sarah Lucas. As you round the corner and are faced with three giant egg-shaped structures. 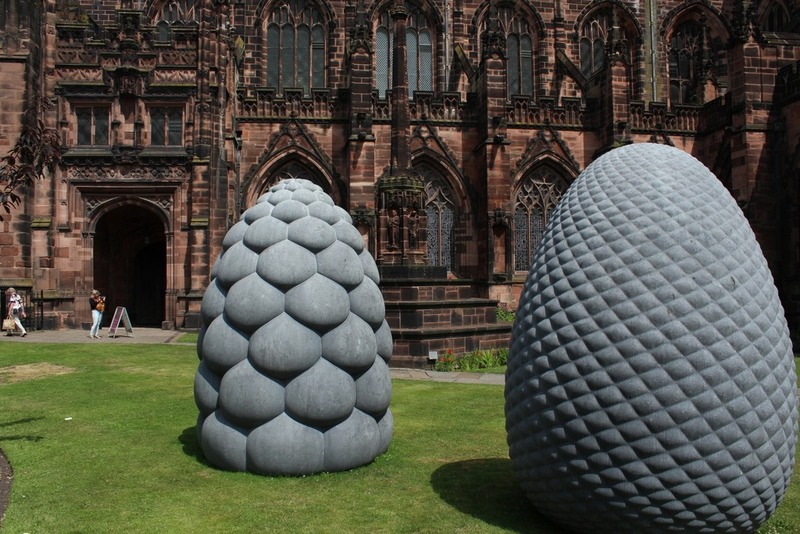 Fructus, Phyllotaxus and Corpus by Peter Randall-Page. I saw these being delivered off the back of the lorry with a crane on my way into work. My picture shows two of the three. 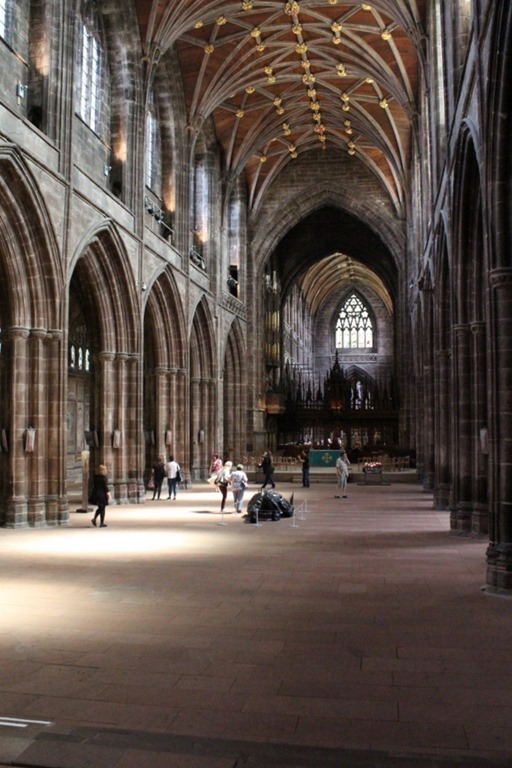 From there it is into the cathedral through a path less-used which is actually rather pleasant, the normal entrance takes you through a winding path past the refectory whilst the exhibition entrance takes you directly into the south transept of the cathedral. Either side of the entrance are re-workings of guarding lions. Comme des Lions by Olivier Strebelle. 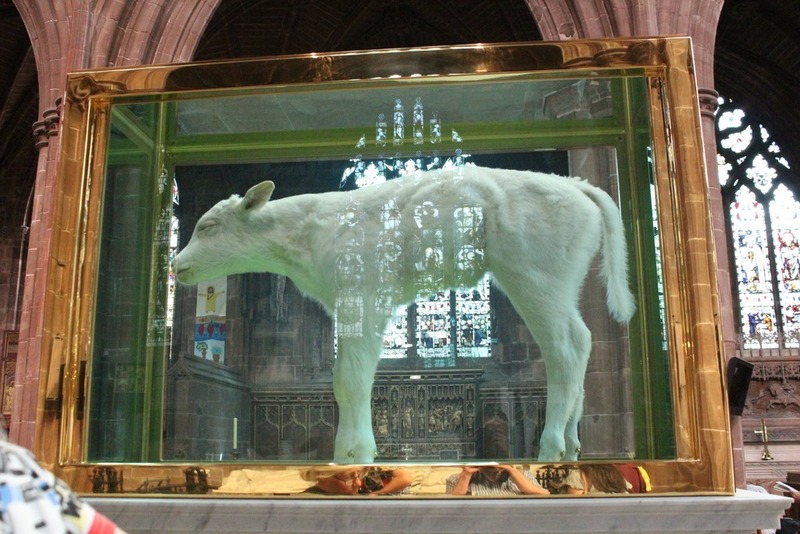 As you go in the first “sculpture” that will catch your eye is most likely Damien Hirst’s False Idol. 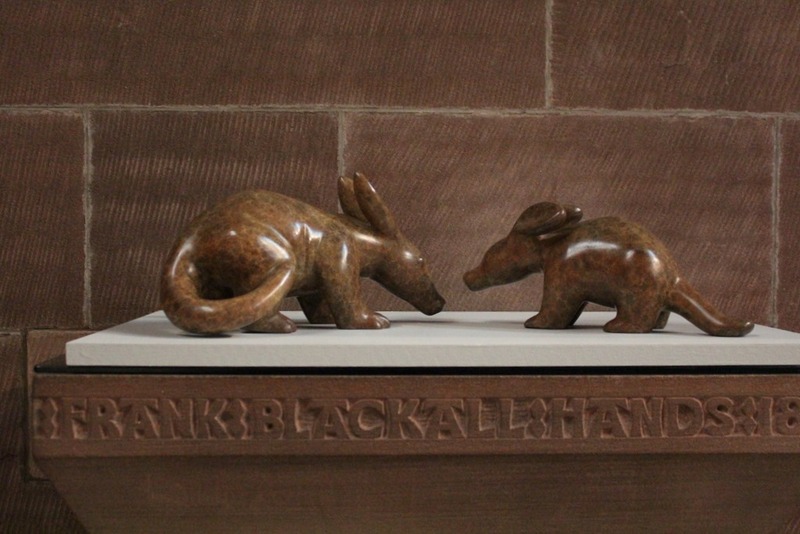 Even a philistine like me recognises the names of some of the sculptors featured in this exhibition, as well as Damien Hirst there are pieces by Anthony Gormley and Barbara Hepworth amongst many others. 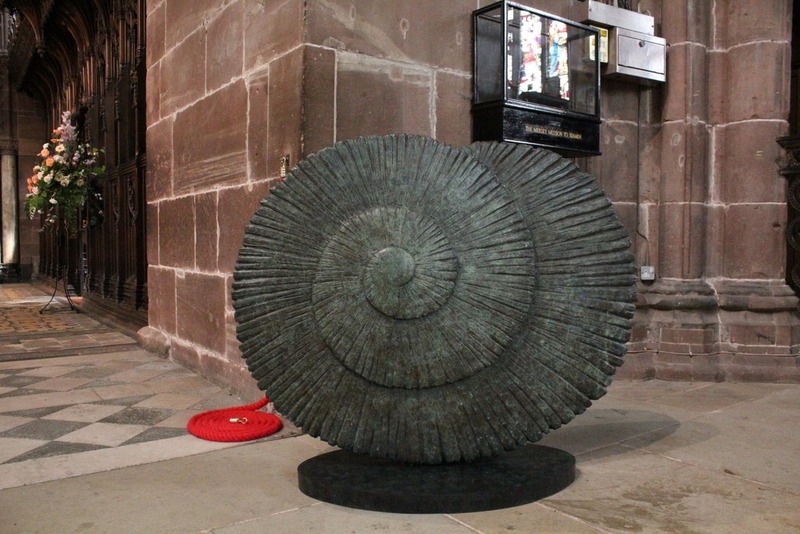 One of the exciting features of the exhibition is the placement of the pieces in the cathedral, what objects they sit alongside. Perhaps this is best illustrated with one I only spotted when I was reviewing my photographs at home. The sculpture in the foreground picks up the fluting of the rather fine Victorian radiator in the background. Radiators were, apparently, the original inspiration for the piece although Mrs SomeBeans and I were both reminded of bacteriophage viruses. I like the way Ann Christopher’s Line of Silence picks up the colour of the fresco behind it. The theme of the exhibition is animals, hence the name ARK, I must admit this didn’t strike me as I went around. Perhaps this is through frequent exposure to Chester Zoo which means I anticipate that every attraction should be filled with animals. 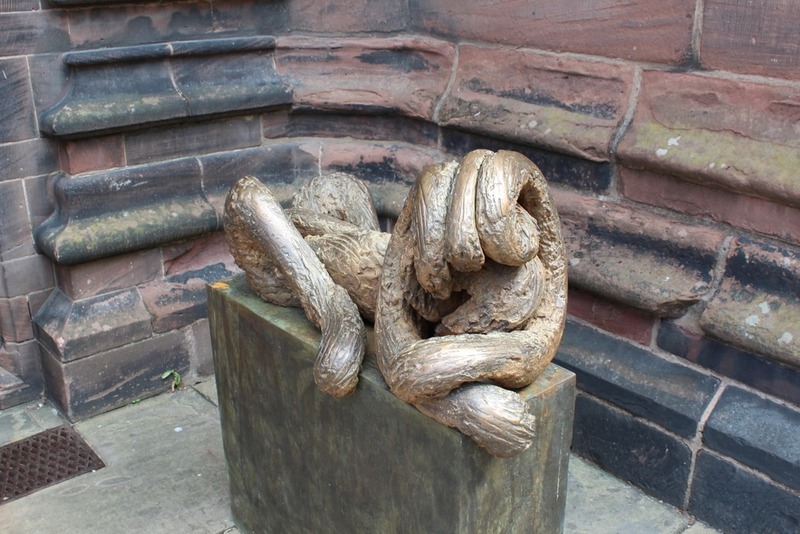 Anyway, we liked the Aardvarks (mother and child) by Anita Mandl, as we like the aardvarks at the zoo. Another theme is reflections, a number pieces are highly reflective and the cathedral has some excellent features to reflect. 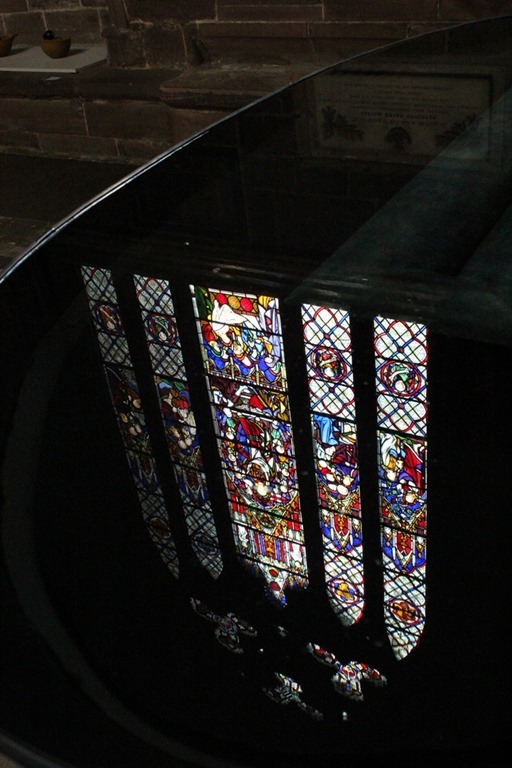 This is William Pye’s Coraslot, reflecting a stained glass window. 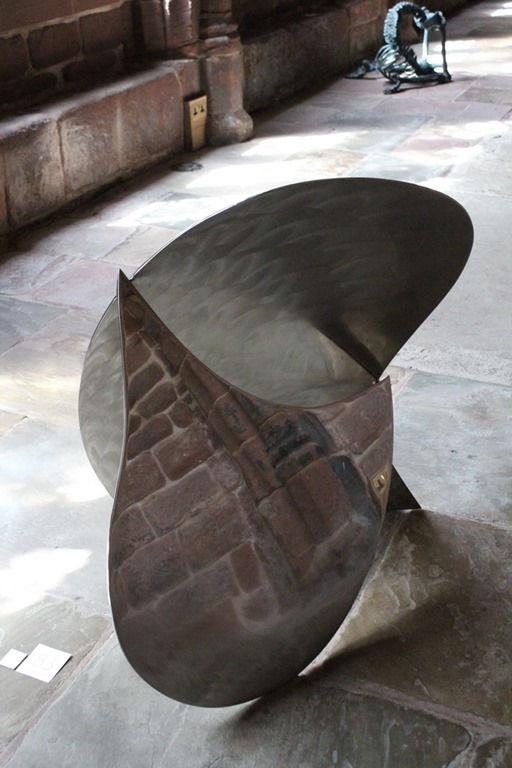 I think this is Bryan Kneale’s Curlew, reflecting some stonework in the cloisters. It might be Plover. 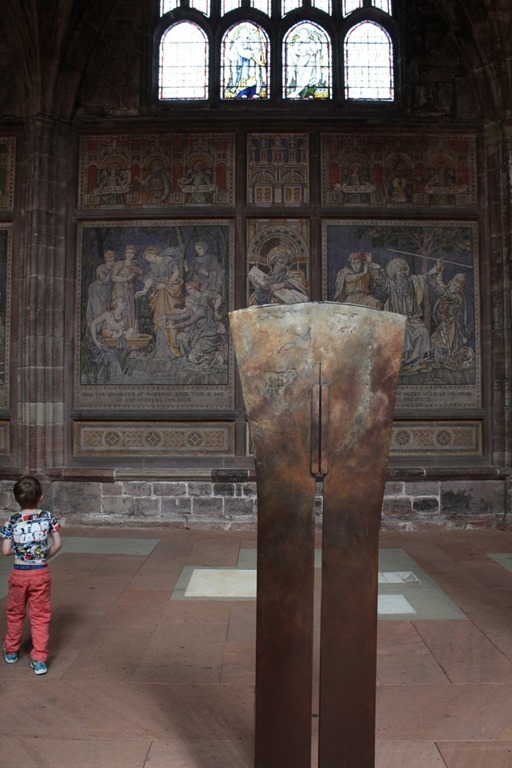 At one point I thought “who’d have thought of putting art into a cathedral”, thereby wilfully ignoring some 1500 years of the history of art in Western culture! An odd thing about the exhibition is the way it makes you look at the cathedral in a different way, this is the view down the knave. Normally this view is “spoiled” by ranks of chairs for the congregation but here it is largely empty with pools of light falling on the floor from the windows. 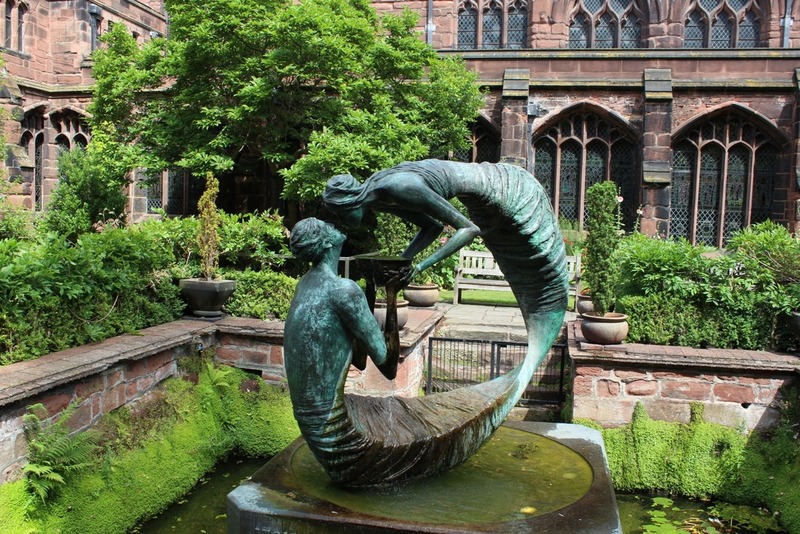 The cathedral isn’t a stranger to sculpture, The Water of Life has sat in the cloister courtyard for twenty or so years. 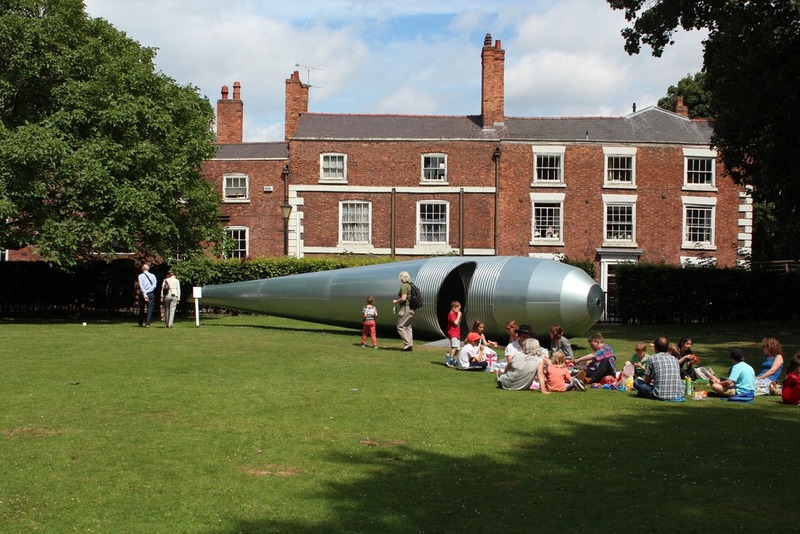 The fun finishes outside with more sculptures in the grounds, this is Eilis O’Connel’s Capsule for Destinies Unknown which reminded Mrs SomeBeans of silverfish. I like the juxtaposition of the picnickers and the Georgian cathedral precinct buildings. Thinking back the only art I’ve previously appreciated to this level has been land art around Grizedale Forest Park where again the art picks up its surroundings. You can see all my photos online here, I’ll try to label them over the next few days. Go see this! We’re definitely going again.